Congratulations to Rosemary Vayalikunnel '19, who placed first at the district level of the Optimist International Oratorical contest held this recently in Bellingham, Washington. 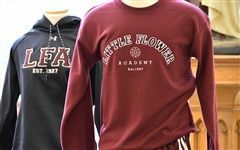 The LFA Parents' Auxiliary is introducing a brand new Spirit Wear line for the whole LFA community. This initial, limited time offer gives our community an option of two classic, high quality sweatshirts that are perfect for showing school spirit whether you're a parent, alumnae or current student. Our Little Flower Academy soccer team were brilliant throughout the post-Spring Break BC Catholics Championship. Gabby Lee '19 and Eleanor Morrison '19 delivered key goals against Archbishop Carney, to secure the victory in the bronze final. Indeed, LFA went 4-1 in the tournament and showed they've got a special group this year. 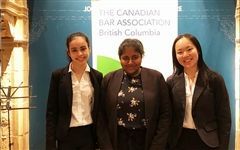 Congratulations to Joyce Chen '21, Asha Mior '20, and Jeanna Pillainayagam '19, who competed against an unprecedented number of students from across BC at this year's Barry Sullivan Law Cup. All three made the finals! Upcoming games, recent results, game photos and team information for all of our LFA teams. All in one place. Visit Athletics News & Events. First Bell at 9:27 am; with Choir at 8:20 am.